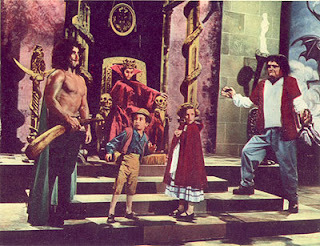 Last Christmas we started the current season of Schlock Treatment with the Mexican kiddie nightmare of Santa Claus vs Satan. This year it’s an even stranger treat, if that’s at all possible: Little Red Riding Hood And The Monsters, another Mexican kids film AND a horror film from the same distributor, K. Gordon Murray. It’s grand guignol for the under-fives, a relentless catalogue of grotesqueries designed to give your bad dreams nightmares, and turn the water in your bathtub black. Little Red Riding Hood is just one series from K. Gordon Murray, Florida’s High Priests of Hyperbole. Born the son of a funeral director, his first job in Hollywood was hiring the Munchkins for The Wizard of Oz after learning the noble art of hucksterism on the carnie circuit. The cumulative effect was profound: a deep appreciation for the carnival and the grotesque. And where else do both traits run deep but South of the Border. 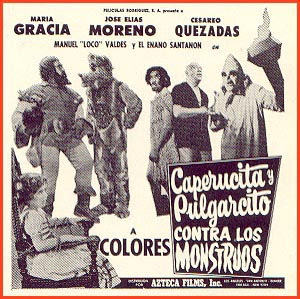 In 1959 Murray bought a huge package of Mexican horror, fantasy and kids films, at first dubbing them into English in Mexico City for the lucrative American drive-in and TV market. It proved cheaper to set up his own dubbing studio, and thus Soundlab in Coral Gables, Florida was born, where Murray perfected (and practically invented) a factory-line process known as “looping”, in which features were dubbed in one minute lengths of film. 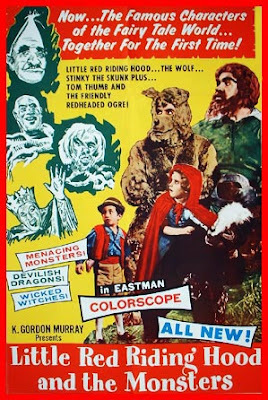 Murray sold most of the horror films as packages to late night TV spookshows; the kiddie films, on the other hand, were for the weekend matinee circuit Murray virtually created with Santa Claus in 1960. For the next five years Murray was the Terror of Teeny Town and considered a serious rival to other distributors, often dubbed the Anti-Disney due tom the perceived poor quality (and possibly their inherent “eeeevil”). 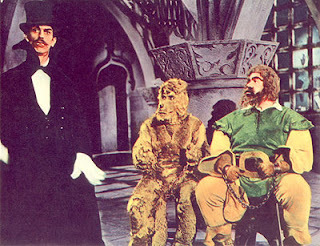 When the Mexican films dried up, Murray imported a few German movies like Rumpelstiltskin, which wins the award for Ugliest Midget Ever in a Lead Role. But they were less successful and culture had moved on; by the late 60s Murray moved into Florida real estate and construction, and passed away with very little hyperbole in 1979. 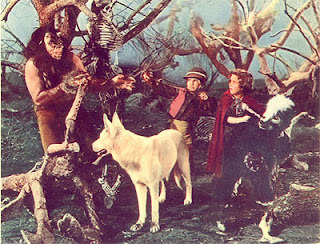 Little Red Riding Hood And The Monsters is actually the third in a series from Mexico, after 1960’s “Caperucita” and its 1961 sequel. The film wastes no time plunging us into a bleak other-worldly landscape known as the Devil’s Domain, and into a gothic castle dubbed the Lair of the Monsters, where the Queen of Badness presides over a jury of malformed miscreants: Dracula, Frankenstein, Siamese thugs “Two in One”, a robot, and a thick-browed pinhead called Carrot Head. 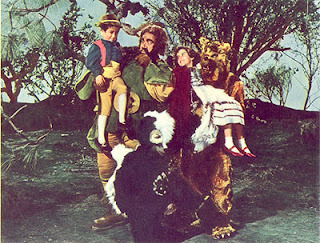 Little Red Riding Hood’s friends, the Ogre and the Ferocious Wolf, have been captured by the Queen to trap Little Red (or Red for short), who hates her because she’s beautiful. 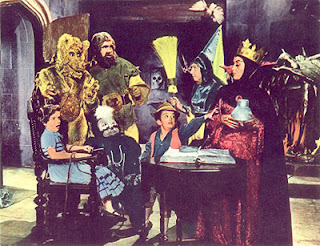 The Queen actually does turn the water black and the town’s children into monkeys; Red, along with inch-high Tom Thumb, who’s zapped by the Fairy of the Dawn to full size, and a skunk called Stinky (who sounds like Alvin from the Chipmunks) enter the Devil’s Domain to save the kidnapped children and lead them on a crusade against the Queen of Mean. All of which is guaranteed to turn your brain to porridge. Usually more care is taken with the dubbing, but this is a musical – with the world’s most excruciating musical score to boot - where the mouths don’t match, and I can almost guarantee K. Gordon Murray didn’t have a professional singer on staff. Thus we get these strangled human puppet shows that sound like a mad woman sawing a cat in half. In case the film wasn’t strange enough, Murray’s schizophrenic soundtrack gives the film an even more “other-worldly” quality that, and I can only speak for myself, is completely and utterly addictive. I don’t need to tell you films like this produced the generation of freaked-out flower children and acid burnouts. Murray would augment the screenings with “live” appearances by the Ferocious Wolf and Stinky the Skunk. Specially tailored for the Kiddie Matinee circuit, God alone knows what the kids would have made of two Florida carnies in plushy suits, and only time will tell what effect this will have on you, our viewers. Merry Christmas everyone from Little Red Riding Hood And The Monsters. If Footmen Tire You, What Will Horses Do? (1971) and The Burning Hell (1974). For our next Christmas treats we have a pair of Christian horror films – yes, Baptist exploitation movies – from the feverishly righteous imagination of the Ormond Family. The Ormond Film Organization was a grass roots film production and distribution company from Nashville headed by husband and wife team Ron and June Ormond, later with their son Tim. 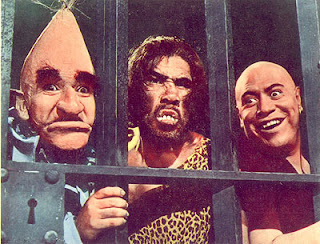 Ron worked with the family on a series of increasingly lurid exploitation titles: Untamed Mistress, Please Don’t Touch Me and my favourite Ormond shocker, The Monster And The Stripper (1968). By the early 1970s the Ormonds found Jesus and from their work on outrageous gore-laden If Footmen Tire You, What Will Horses Do? 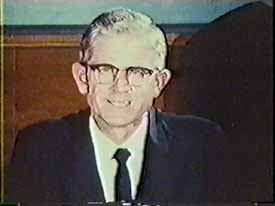 (1971) as hired guns for doomsday Baptist sermon-monger Estus Pirkle, the films took on a new purpose; their’s were still exploitation films at heart, but were first and foremost exploitation films for God, or “Godsploitation”. “REALLY fundamental” is more than an apt description of Estus Washington Pirkle. From his home base at the Locust Grove church in Mississippi, Pirkle thundered relentlessly across the Baptist circuit in the Southern States until ill health slowed him down, and passed away in relative quiet in Tupelo in 2005. Like all touring preachers, he had one sermon he was famous for; his calling card was a virulently anti-Communist diatribe called “If Footmen Tire You, What Will Horses Do?”, a violently apocalyptic vision of America under Godless Communism. Pirkle didn’t just see Reds under the bed - they were in the streets gunning down children, or in the pulpit up to their elbows in Baptist entrails. 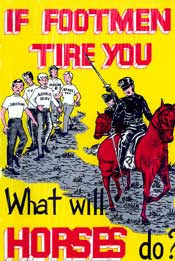 When Pirkle approached Ron Ormond to make a filmed record of his “Footmen” sermon, Ron certainly didn’t forget his exploitation roots and crafted what can only be described as an absurd combination of classic cold war propaganda (like a Biblical “duck and cover” training film) and hysterical Baptist fire and brimstone fear-mongering, tarred with a thick layer of fake blood and feathered with donations from Pirkle’s congregation of frightened big-haired matrons, stoic Southern gentlemen, mature-aged boy scouts and spooky Addams Family children, in return for bit parts or screen credits. 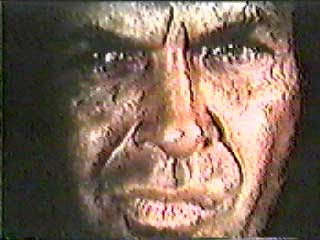 The Burning Hell (1974), a glimpse of a sinner’s own personal apocalypse, was the Ormonds’ second and most widely-seen Christian feature. Little wonder it traveled so well South of the Border - boasting a cast of hundreds (again, Estus Pirkle’s family and deep-pocketed congregation) and international locales, The Burning Hell is an intense, over-the-top theatrical experience. Estus W. Pirkle stands looking thoughtful, perched precariously on the rocky slopes of Mount Sinai in Israel, as Moses suddenly appears, complete with huge department store Santa beard and eyebrows, to face a crowd of renegade Israelites and calls upon God to opens up the Mount to swallow them up. Without warning the camera shakes and a smoking hole appears; helpless sinners and even entire tents fly into the gaping mouth of Hell. Pirkle turns his horn-rimmed gaze on the camera and spits out, “Does that shock yew?” This is but a glimpse of the horrors to come, courtesy of the fertile imaginations of the Ormond Organization, for those of us who do not believe in a literal Burning Hell. There’s scant relief from the relentless downward spiral into the pit with the odd bloodless tale from the Bible, all filmed in the Holy Land with a staggering array of fake beards and headdresses. But fear not - whenever the pace lags for a moment, the Ormonds head straight back to the good ol’ eternal torment, “where the worm dieth not and the flame is not quenched”. And in case you don’t believe there will be worms - they’re right there in the Bible AND, in true Ormond style, front row centre on the screen. Close-up after hideous close-up of squirming maggots on contorted faces. “Think of the terrible odours!” Estus point out. “The continual itchiness!” For the grand finale set in “Hay-yull”, the Ormonds outdo themselves with a nightmarish menagerie of creatures, including the “locusts” described in Revelation: a surreal creation with the body of a horse, gold breastplate, teeth like a lion, hands of a woman, a crown of gold and a scorpion tail lashing at sinners. Even the Devil shows up dressed like the Riddler, an incessantly tittering fop who taunts a wide-eyed Tim Ormond with the promise of everlasting anguish. I guarantee you have NEVER seen anything like this. From the fiery depths of the Schlock treatment archives we are proud to present the twisted, the outrageous, the clinically insane If Footmen Tire You What Will Horses Do? and The Burning Hell. Click here for an exclusive Schlock Treatment interview with Tim Ormond, actor and son of director Ron Ormond!